Given that no other popular music group has garnered as much critical and creative analysis as The Beatles, any new book or film release claiming to add substantive perspective to what’s already been documented should be regarded with relative skepticism. Or, at the minimum, a keen sense of discerning the validity in the presented material. 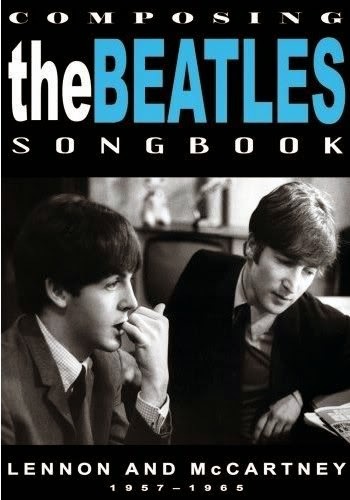 In one of the latest critiques, a DVD entitled Composing The Beatles Songbook: Lennon and McCartney 1957 – 1965, the twentieth century’s most successful songwriting partnership is discussed and examined. Much like the Under Review series of music documentaries, this film features commentary by journalists (including Anthony DeCurtis, Nigel Williamson, and Robert Christgau) and friends or associates of the subjects (including Barry Miles and Klaus Voorman). As well, archival clips of The Beatles complement the observations, but this is an unauthorized film so the footage is negligible. And though the title suggests that the content addresses matters as far back as 1957, the film only provides cursory (and otherwise well-known) information about the band’s formation, concentrating mostly on the period spanning With The Beatles and Rubber Soul. In essence, the film summarizes the two principle songwriters’ working dynamic and how the partnership theoretically progressed from Lennon/McCartney to Lennon versus McCartney. The boldest contention made is that, in the band’s early years, the collaborators’ prime objective was to write “Beatles-sounding” music, not necessarily “John” or “Paul” songs. The panelists accordingly agree that on tracks like “Please Please Me” and “She Loves You,” Lennon and McCartney’s voices sound virtually synonymous. That logic only sustains so far, though, if one considers Lennon’s vocal on “This Boy” or McCartney’s singing on “I Saw Her Standing There,” both tracks from the band’s earliest era. If you know your Beatles history (as only those with serious knowledge of the band will have the fortitude to watch this film), you’ll likely feel compelled to argue with some of the commentators. It’s not because they’re factually wrong or radically off base in their assessments; it’s simply because their opinions can often be refuted or discounted. For instance, hearing Robert Christgau explain why he prefers the Lennon-penned “Hard Days Night” to the McCartney-penned “Can’t Buy Me Love” doesn’t make me like the latter any less. Overall, Composing The Beatles Songbook: Lennon and McCartney 1957 – 1965 gives Beatles fans a critical synopsis of information and stories that they probably already know some version of by heart. The film doesn’t offer much in the way of original or enlightening information, but those with sufficient knowledge of the band’s history will find it at least somewhat interesting.